NC Wineries are the perfect place to visit this fall. Looking for a destination for your fantastic fall foliage drive this year? There are 25 wineries all within 1 ½ hours of Asheville. Imagine exploring the vineyards of WNC, enjoying wine tastings at beautiful wineries or picnicking amid the streams and mountains surrounding the vineyards. Surprised that we have so many wineries here? You can check out the smallest, complete, free standing winery in America at Calaboose Cellars in Cherokee County or visit a winery with vineyards situated on both sides of the Eastern Continental Divide at some of highest elevations on the East Coast at Burntshirt Winery in Hendersonville. Every winery has a story! NC Wineries and their wines are creating quite a stir in the wine world. We are one of the fastest growing wine regions in the country and our wines are winning international, regional and state-wide medals for excellence. Whether you prefer the fine dry reds and whites, the delicious semi-sweets or the down-home taste of our native Muscadine wine you will find them all within a short drive of Asheville. 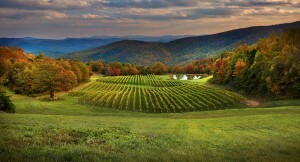 Forget Napa and Sonoma and check out NC Wine Country. You’ll find everything you need to plan your trip at WNC Wine Trails. NC Wineries are growing every month! We are now up to more than 150 wineries state wide. Surprised?! Even more surprising is that prior to prohibition North Carolina was the largest wine producing state in the country! Of course, at that time it was primarily our native Muscadine wine – yes that sweet wine that everyone says their grandmothers used to make for them. The Muscadine wines have matured over the years. Read more about the history of NC Wine and the Muscadine grapes at North Carolina Wine Gifts. Go out and discover NC Wine Country this Fall! We just returned from our Fall Sip Trip and you’re right, there couldn’t be a better time to visit North Carolina Wineries. The weather was perfect, the leaves were starting to change, and we got a great inside scoop from how harvest is going! That is great. Can’t wait to go on a tour of my own soon!! I haven’t been on a good winery tour in way too long, and there are so many good wineries to tour in the local area! The history of wine here in North Carolina is indeed fascinating– I had no idea that it was the largest wine producing state in the country prior to prohibition. Thanks for the link to WNC Wine Trails! I have now vowed to go on several winery tours soon!